Business leaders everywhere are plotting out their digital transformation strategies, and how to get closer to customers - fast. But there's a looming challenge: Real digital transformation requires fast, sweeping modernization of development culture, processes and old systems into new cloud-based systems that are agile, mobile, and able to deliver disruptive, real-time intelligence. Without major changes in your development shop, a digital transformation will struggle to take hold. 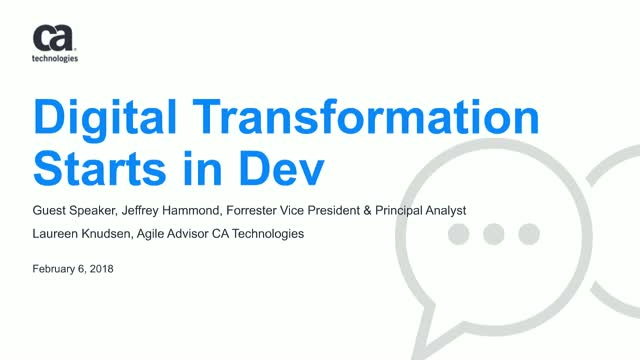 In the first part of this series, guest speaker, Forrester Vice President and Principal Analyst Jeffrey Hammond and Laureen Knudsen, Agile Advisor at CA Technologies, will introduce a framework to guide your development shop transformation, with best practices that put the customer at the center of software delivery efforts. We'll discuss the cultural, structural, and talent acquisition processes firms are using as they refashion how their development teams gear up for faster delivery. In particular we'll look at changing organization structures, how teams are scaling up Agile delivery, and integrating Agile practices with customer-focused experience design practices.